During the 1997 Christmas season, Rob Mock, having limited tools and experience, decided to carve a bookmark as a stocking stuffer. While the bookmark did not survive (thanks to mass destruction from one of Rob's canine kids), a passion for woodcarving thrived. A lot has happened since 1997. 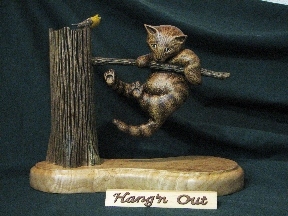 Rob has carved a wide variety of pieces whereby a mere block of wood evolves into an artistic creation. Perhaps his greatest creation is Trixie*s Combo, a one-of-a-kind western carved electric guitar and matching amplifier featured in both Woodcarving Illustrated and The Fretboard Journal magazines. To further showcase his work, Rob launched Triple C Woodworking in 2010 (www.triplecwoodworking.com ). Triple C stands for Custom Carved Creations which enables Rob to showcase his woodworking talents through original works of art and custom commissioned pieces. Always seizing opportunities to expand his talents, Rob began a collaboration with Jim Warwick of J. Warwick Guitars. Rob and Jim's complementary talents and unrelenting imaginations allowed them to pursue a common vision, resulting in stunning guitars adorned with Rob's customized, intricate carvings. Jim recently moved out of the area, but Rob continues spending a vast amount of time in his workshop, creating unique pieces of art. Rob is also afforded the opportunity to share his talent by teaching group woodcarving classes at his local Woodcraft store and he also teaches individual, private lessons. Yes, a lot has happened since 1997.